Photo courtesy of Timothy Hines. What do you expect when Grandpa is drunk? Ah’m jusht teshting it, shon…hic! Mumblings of an Old Man: Fancy bottle, fancy box, twist off top. I imagine thay mean something like the label; “Grandfather Port”. Buckwheat doesn’t shocme. It’s the price! The old man mumbles because he was hit by his wife with this bottle. The tasting of buckwheat has flown deep and extended the limits of its mouth. This alcoholic beverage is., Shocyu. Buh Alfalfa! Yuh know yuh shuldn’ drink dat! Buh-weet says so! Ingredients: War stories, complaints on the current generation, thoughts on medicare, red 17. One shot of this and you’ll feel through time. if the old man mumbles through 38% alcohol, he sure has lived a time worth mumbling! Dang, that’s gotta be some strong stuff. It makes time feel flow. It’s always been my life goal to get so drunk I mumble like an old man. Now I know I have a classier alternative than bum wine for that goal. Oopsh I jusht peed myshelf. 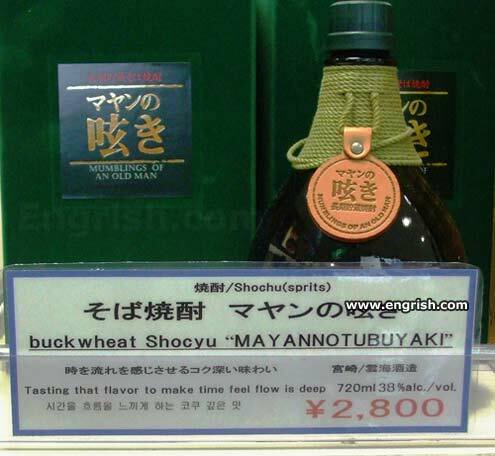 “Mayan Not U Buy Aki” – yeah, Time, you feeling that deep flow, yet?? 2012 is coming! I can’t drink that Mummblings of an Old Man, it keeps going on about how they didn’t have liquer stores and they had to walk three miles into the forest to make our own hooch in the snow. Surgeon Generals Warning: overconsumption may cause crotchetiness, overprotection of the lawn, phrases starting with “back in my day…” and intolerance of kids today with their music and the way they wear their pants around their ankles. the only liquer that makes you complain about today’s youth! It’s like there’s a Bob Dylan concert in my mouth and nobody can afford a ticket! Aw, come on grandpa, have you been hitting that stuff again? Caution: um, uh, may cause, um, uh, random, um, uh, mumbling about, um, uh, when I was your age, um, uh, when, um, uh, taken um, uh, internally. Korean translation fail as well. Son, when time feels flow is deep, you have tasted that flavour. You- you know, this flavor reminds me of the crap they gave us to drink in that prison camp… lost a whole year of my life there, an’ when they broke us out, I couldn’t remember where I’d put my library card… Shoc yu, I’m not mumbling! From the liquor cabinet of Ernest Hemingway! I think I drank too deep cause time was flowing really fast. May An not u buy Aki!